In education circles, the talk is about “STEM,” or science, technology, engineering and mathematics. To Anne Taylor, professor emerita, School of Architecture and Planning, the appropriate acronym is “STEAM,” which adds an “A” for arts and architecture. Taylor knows a lot about education. She taught art education through the College of Education, served as dean of the Graduate School and taught in the School of Architecture and Planning for many years. 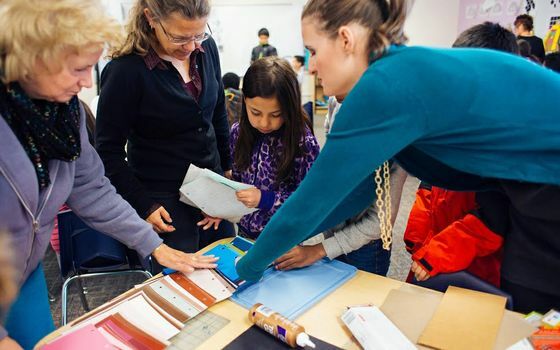 Her passion has always been to take the techniques used in architecture studios and apply them to the classroom to teach and learn everything from math and health to science and social studies through design. Taylor said that the architecture studio design model is geared toward hands on learning that is both creative and requires creative problem solving, which are critical components of education. The curriculum that Taylor developed with architect George Vlastos, Architecture and Children, is now available in Spanish. “Children who have come across our southern border do not have English verbal literacy, but what they do have is visual literacy. They can draw, design and build models through the studio design model of the architecture world,” she said. Taylor is offering professional development opportunities for teachers to use the Spanish language version in bilingual programs. The program was translated by Catalina Salinas who is using the program in teaching Spanish at Instituto Cervantes at the National Hispanic Cultural Center. “It’s already in use in Japanese and Turkish and under development in Chinese and Korean,” Taylor said, adding that in Japan, a network of teachers, schools and architects has been established since 1991. UNM architecture student Taylor Small (r.) arranges students' portfolios. Eubank Elementary School has a diverse population, with many students from the continent of Africa as well as Mexicans, Central Americans and Native Americans. “We are in the middle of a three year agreement with the school. We worked with third graders last year, fourth graders this year and next year we’ll work with fifth graders. We will do an assessment to see if math learning and other subject areas are impacted positively through the program,” Taylor said. Eubank is a also a fine arts magnet school with 100 percent of the students qualifying for Title I and the majority of the students come from section 8 housing, according to Principal Christy Sigmon. “My goal, when I sought out the Architecture for Children program, is to expose students to a world different from the environment in which they live. If they find a passion, they can make a career out of it and break the cycle of poverty. Not only am I trying to level the playing field, but I am also trying to create a different kind of life long learning for our students. If we can open the door to a bigger world, then maybe they just might step through it,” Sigmon said. Working with fourth graders means learning about New Mexico history. “We are using Chaco Canyon as a theme to understand a civilization through its architecture. The students are learning to draw, do plan and elevation, do site analysis as well as build models,” she said. “With Anne Taylor’s model, they are getting the components of art/design, engineering and math. This year, this particular group of students is learning about the elements of Chaco Canyon, which is aligned with the fourth grade social studies standards. They are learning about the importance of how the design and the materials of structures contribute to protection and shelter.” She added that they also learn about agriculture, use of and protection from sunlight, and how the design of meeting spaces influences communication. Practicing architect volunteers as well as UNM architecture students staff the Eubank program. The UNM students are from Atsuko Sakai’s Architecture and Children class. “Many are international students interested in taking the program back to their countries. One student is interested in translating the program into Portuguese for use in her native Brazil,” Taylor said. Another benefit is that the elementary students genuinely enjoy having college students in class. “It gives them an exciting image of college,” she said. Students at Eubank Elementary School review a town design poster displayed by UNM architecture student Taylor Small. It is difficult to change the way school is taught in New Mexico, she said, because of the testing demands imposed by the state. “We are working with the Legislative Education Study Committee to consider the Architecture and Children curriculum as an integrated way to learn creatively. A student’s portfolio is an antidote to rote testing. The portfolio clearly demonstrates how well students progress in communication skills, interpreting data, measuring, motor skills – everything from the technical to aesthetics and creativity,” Taylor said. The follow up she plans with the Eubank students next year will make those judgments through their portfolios and pre post evaluation. The “A” that turns STEM into STEAM also gives students an active role in their education, and that’s aces.